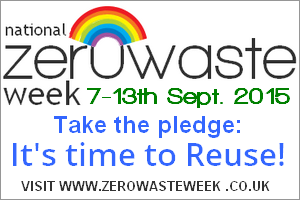 Zero Waste Week is in its 8th year of running! It’s held next week from 7th – 13th September 2015. We’re looking for YOU to get involved and to pledge to reduce your waste. This year’s theme is ‘REUSE’ – basically stop wasting money by saving resources! I’m an ambassador for the week and my pledge is to buy food for a week without packaging. I’ll ‘reuse’ my old packaging when shopping. e.g take my own container when buying fish / meat / eggs / veg and fruit. No new packaging or plastic will be used! I’ll be posting about my experiences here over the next few weeks. Or alternatively just do your own bit at home for you your family. Let’s fight waste together for a healthier future and planet!!! This entry was posted in Blog posts on August 31, 2015 by carolinementzer. This is such a fantastic pledge which I know will inspire others to take part too. Enjoy the week and good luck! I look forward to reading about your ingenious methods of reuse!